Freesias are perennial flowering plants named by botanist Christian P. Ecklon for his fellow botanist and friend, Dr. Friedrich H. T. Freese. They are a member of the Iris family (Iridaceae) and native to southeastern Africa. In homage to the symbolism of friendship they once held for these two botanists, freesia flowers continue to symbolize friendship and are a popular choice among florists for use in bouquets and arrangements. Often used in wedding bouquets, you will also find these fragrant flowers in scent profiles for lotions, soaps and other personal care products. 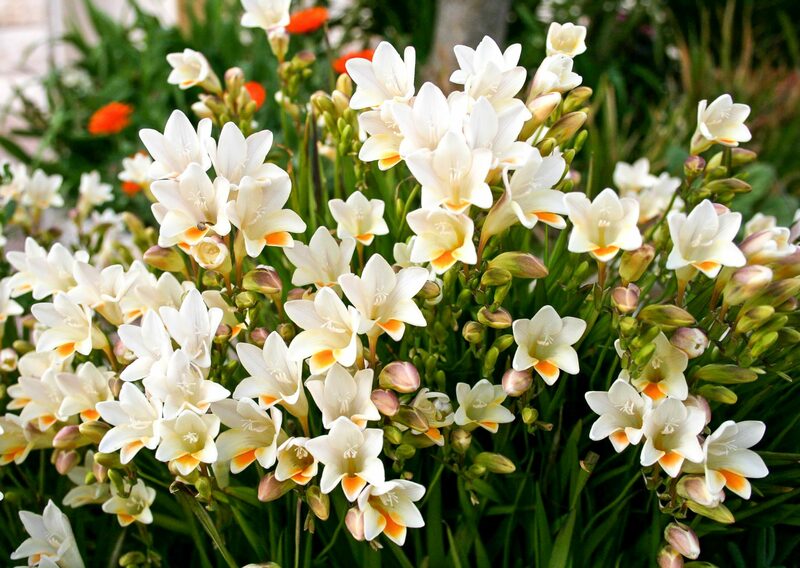 Freesia flowers come in shades of white, yellow, pink, mauve, red, orange, purple and lavender. This means that you should have no trouble finding a hue to complement your existing landscape design. Since they are often used in bouquets and floral arrangements, they are also an ideal choice for your cutting garden. Freesia flowers can be grown indoors or outdoors and in containers, raised garden beds or the ground. They are hardy in zones 9 and 10 where it is best to plant them in the fall. In cooler zones, it is best to plant them in spring. Freesia plants prefer a sunny spot in your garden, but you may want to choose a spot with some afternoon shade, since freesia flowers sometimes refuse to bloom if it is too hot. If your chosen spot does not already have fertile, well-draining soil, work compost into the top several inches to add nutrients and improve soil structure. Freesias have a long tap root, so you will want to turn the soil at least eight to 10 inches deep to loosen it and prepare the bed for your bulbs. Freesia bulbs, most commonly known as corms, should be planted about two inches deep and about two to four inches apart. Plant the corms with the pointy end pointing up and water well to help your freesia bulbs settle in. If you are planting freesia bulbs in containers, choose a tall container to allow the long tap root plenty of room to grow. Fill the container with nutrient-rich, well-draining potting soil mixed with compost. Plant the corms pointy end up, about two inches deep and about two or three inches apart. Freesia plants require little care once you have the corms in the ground. You will need to water your plants regularly and will want to keep the soil moist during the blooming season. A deep watering once or twice per week should work most weeks; you may need to water a bit extra when the weather is hot and dry. It will take about 12 weeks for your freesia flowers to bloom and, once they do, you can cut some of them to add to floral arrangements. Deadhead flowers as they fade, but do not remove the foliage. When the plant is finished blooming and begins to move towards its dormant state, the foliage will die back naturally. Once it has died back, you can remove it if you prefer a cleaner look for your garden. If you live in zone 8 or below, you will either need to dig up the bulbs to store over winter and replant them in spring or purchase new corms to plant in spring. To store the bulbs, gently dig them up, allow them to dry, remove dirt and debris, place them in a bucket of peat moss, and store them in a spot that is dark, cool and dry, such as a garage or storage shed. Alternatively, if your freesias are planted in containers, you can move them inside during the colder months. If you live in zone 9 or 10, you can leave your bulbs in the ground over winter and they should return in the spring after they are finished resting. Plant some of your freesia bulbs the first week, some the week after and some the following week to extend the blooming season in your garden. Your border or flowerbed will look even more beautiful if you avoid planting freesias in neat rows and plant them in groupings instead. 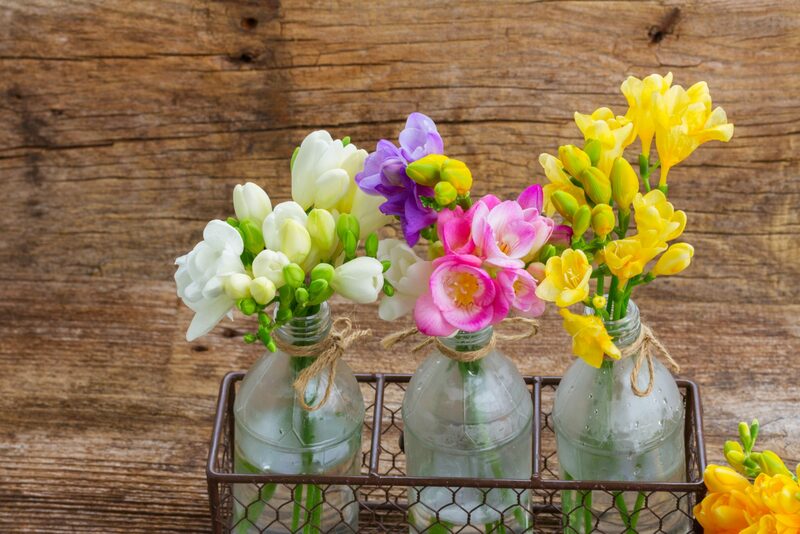 If you are planting freesias for cut flowers, keep in mind that red and pink varieties are more fragrant, but white and yellow varieties will stay attractive longer after being cut. Your freesias may need support as they grow. Inexpensive, green, circular supports are usually the best choice for freesias, but you can also use other types of stakes if you have them on hand.